“Landline” is set in 1990s New York City, just before the tech/mobile phone boom and the loss of grit in the Big Apple. Based on the growing-up experiences of Gillian Robespierre and co-writer Elisabeth Holm, the story is about transitions… Slate’s character to adulthood, the last days of being a teenager for her sister Ali (Abby Quinn) and the dissolution of their parent’s marriage (as portrayed by Edie Falco and John Turturro). It has a bit of a “slamming doors” edge to it, as misunderstandings and family connections blend into a very human story. Slate and Robespierre last collaborated on the 2014 film “Obvious Child,” with Slate becoming a stand-in for some of the unique situations of young adulthood. Jenny Slate is on a hot streak of late, especially in animation voiceover work, with roles in both “Zootopia” and “The Secret Life of Pets.” She was born in Massachusetts, and attended Columbia College as a literature major. While there, she formed the improvisation group “Fruit Paunch,” and continued with a comedy duo called Gabe & Jenny (with Gabe Liedman) after graduation. She had a recurring role on “Late Night with Jimmy Fallon” and HBO’s “Bored to Death,” before gaining further notoriety in a voiceover role, that went viral, as “Marcel the Shell with Shoes On” (2010). After writing a children’s book based on the Marcel character, she landed voice roles in “Alvin and the Chipmunks: Chipwrecked” (2011) and “The Lorax” (2012). After taking the lead acting role in “Obvious Child” (2014), Slate spent two seasons on the FX series “Married,” and also voiced Harley Quinn in last year’s “The LEGO Batman Movie.” HollywoodChicago.com recently talked to Jenny Slate about “Landline,” and her interesting take on the approach to her career. HollywoodChicago.com: Your character of Dana in ‘Landline’ is transitioning into adulthood, and she is having a quarter life crisis. In your own experience, what is the hardest thing about landing into being an “adult,” both in what you’ve had to do and your friends around you? Jenny Slate: I would say – and actually Dana experiences this as well – is that it’s a sign of personal achievement to chart your ‘growth’ and make progress. And as this growth occurs, large gaps can appear that you need to fill in, with what has become what you now prefer. That comes with a feeling that you’re dishonoring your long term relationships by needing those new things. Often those relationships have lasted that long because they are complex, and not because of just being something that has lasted for a extended time. I experienced this with my parents and some older friends, and I never wanted to offend them or seem like I wasn’t there anymore if I asked for something new or more specific. 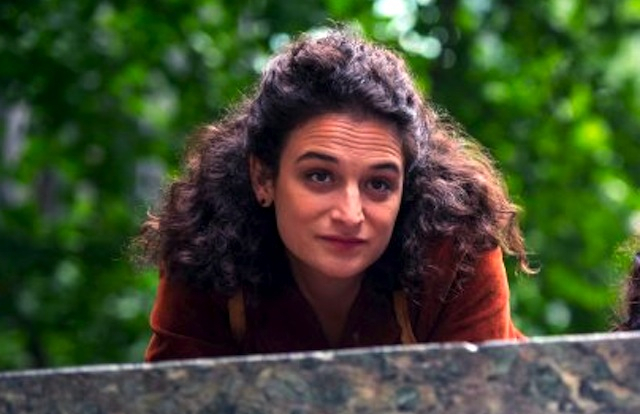 In the audio portion of the interview, Jenny Slate talks about her career and philosophy as an actress, and keeping the right perspective on it all.